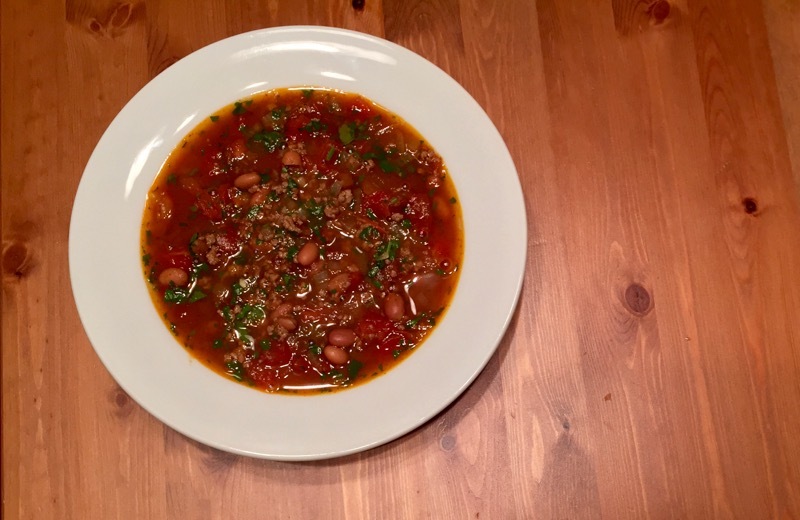 This recipe came to be after I saw a few Instagram posts from people making homemade soup on a chilly day. I took a look at the ingredients around the kitchen, wanting to come up with something that needed little or nothing from the grocery store. The result was fantastic! If you like your soup thicker, squish some of the beans against the side of the pot with a wooden spoon. Place a large pot on medium-high. Add the beef and cook, breaking apart until nearly browned. Add the onion and garlic. Cook, stirring occasionally for three minutes. Stir in the beans, tomatoes, water, salt, pepper, chili powder and cumin. Bring the heat to high. When a boil is reached, reduce heat and simmer uncovered for ten minutes. Remove from heat and stir in cilantro immediately before serving.